Most of us on IBM i (aka iSeries, AS/400) now develop in a mix of languages and platforms. Diverse languages has meant different source code management (SCM) systems, some open source. It’s been every IT manager’s “holy grail” to manage all of this code in the same tool: one repository, one branching system, one way to manage versions. So the traditional native IBM i SCM tools are losing ground. Welcome Subversion (SVN), Git for distributed version control, and Team Foundation Server (TFS). But each of these SCM tools fails in two key areas: the Build (recompile) and Deploy of IBM i artifacts. IBM i technology comes in many variants, and without specific handling, teams face heavy manual effort and the risk of error. 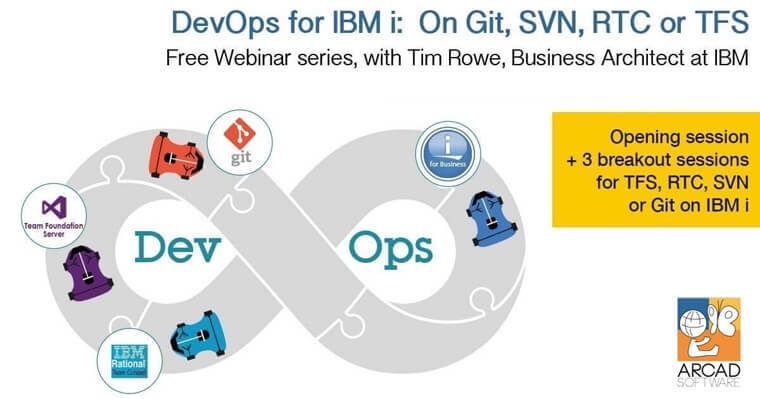 Our Webinar series opens with a general session on DevOps for IBM i, introduced by Tim Rowe, Business Architect at IBM. Then three breakout sessions demonstrate the ARCAD Pack for DevOps on Git/SVN, TFS or IBM RTC respectively. Tim Rowe has worked for IBM in Rochester, Minn. for more than two decades. He is currently the business architect for application development on IBM i with responsibility for ensuring that the platform has the infrastructure and components necessary for customers to develop, build, run and administrate world-class applications on IBM i. Tim spearheaded the re-write of the IBM i Modernization Redbook, a highly comprehensive guide spanning database and application architecture, source code and user interface. Ray Bernardi is a 28-year veteran involved in the System 38/AS/400/iSeries/IBM i development and currently is a Pre/Post Sales technical Support Specialist for ARCAD Software, international ISV and IBM Business Partner. Ray has been involved with the development and sales of many cutting edge software products throughout his career, with specialist knowledge in Application Lifecycle Management (ALM) products from ARCAD Software covering a broad range of functional areas including enterprise IBM i modernization and DevOps. In addition, Ray is a frequent speaker at COMMON and many other technical conferences around the world and has authored articles in several IBM i publications on the subject of application analysis and modernization, SQL, and business intelligence.